Am I forced to mount via CIFS (in /etc/fstab) all my network to be able to work on documents, presentations and etc via LIBREOFFICE? What I've noticed too is that OpenOffice 3.2.1 does such handling (it open CIFS mounting and directly SAMBA Shares, remote path)... So, if both programs have come from the same origin (LibreOffice was done by a group that came from OpenOffice group), can you guys open the source code of OpenOffice and "translate" this part to LibreOffice? "You can only select local files"
I suppose it's Libreoffice that's laking support for remote file saving, which is a shame. I'd like to extend this bug report with another related issue. I'm using KDE 4.6.5, Kubuntu 11.04. When I try to access a remote file from a protocol and server that requires authentication (i.e. FTP, sFTP...), a window pops up asking for username and password, but the username field is disabled and you can't modify it. It will let you modify the password field, but the username is disabled and it says "anonymous". I can confirm the problem experienced by HubertB and André Madureira is happening with me too. Ubuntu 11.10 64bit, with kde-desktop, accessing files on Ubuntu 10.04 LTS server. - When opening remote file through Dolphin, opens a local copy in LibreOffice Calc at /var/tmp/kdecache-<username>/krun/... and adds numbers to the start of the file name (i.e. the remote file test.ods would be opened as something like 8310.0.test.ods in the above /var/temp/ address). - Opening the same remote file through the "Open" icon in LibreOffice Calc opens it properly, from the remote address. - Opening the same file through Nautilus (while still in KDE) opens it properly, from the remote address. - I can confirm the same behaviour above with KeePassX (password manager) and Gnumeric but both VLC and gwenview seem to work properly when opening remote audio and picture files through Dolphin. It appears that the fault maybe with the way Dolphin opens these Network shares and cannot properly pass the correct path of the file to the application, so it save a local copy of the file and then passes that to the application. This is a major problem in a business/corporate environment where accessing remote files is the norm. 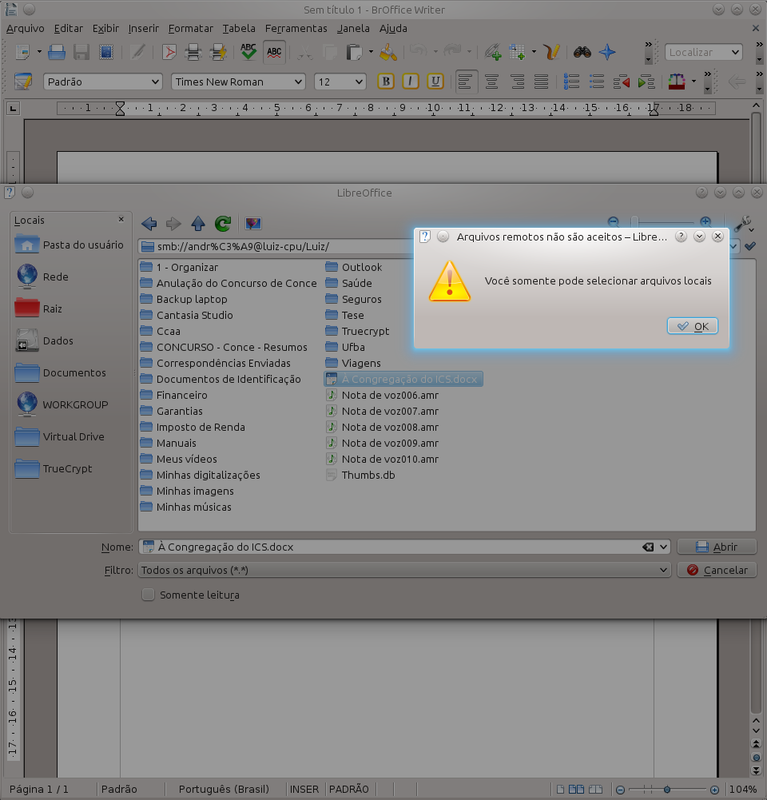 Could you retry if your troubles still exist with LibreOffice 3.5.X on precise? We switched from deprecated GnomeVFS to GIO. I'm using libreoffice 1:3.5.2-2ubuntu1 on precise and the problem is still present. I reported this problem to Launchpad a few weeks ago. My clients couldn't open and save files created in LibreOffice on a Windows network. It was, however, possible to open a file located on a server on a Windows-like network (one using SMB), in LibreOffice Writer, by browsing to the file, using "Places", right-clicking on it, and selecting LibreOffice from the context box to launch Writer with the file being automatically loaded in the process. It was possible to edit the file, opened in this manner, and then save it back to the server. I have now "solved" the problem by upgrading from 11.10 to 12.04 but possibly found a minor bug in the installation script of the 12.04 upgrade so I thought I should report it here for the benefit of those faced with this problem and those who so marvellously fix the issues raised (and for whose efforts I am so grateful!). I am a "mid-range" user (compared to the engineers who work for me.. they are brilliant but not disposed to reporting the things they do.) so pardon me if I write something that is not entirely precise or accurate. Please feel free, anyone, to correct what I say. In the Gnome human interface there is a virtual file system that provides a compatible means by which Linux can interact with a network that uses Microsoft Windows-like file messaging; called SMB (standing for Server Message Block protocol which Microsoft modifed and called Common Internet File System - CIFS). The Linux application that provides compatibility between Linux systems and CIFS file servers is called SAMBA (First developed by Dr Andrew Tridgell - now supported by a team of good guys.). The compatibility layer provided by Gnome to work with the CIFS/Samba file system is called the Gnome Virtual File System. (You may have seen .gvfs in the paths of files. ) In Ubuntu 11.10, there was not a good working relationship between the GVFS and LibreOffice. Indeed, within LibreOffice (and OpenOffice for that matter) running within Gnome, the means of browsing a Windows network, or a network generally, has always been unsatisfactory. (I hasten to add this is in no way a criticism of the people who have given so much of themselves developing these applications!) For example, when browsing for a file in LibreOffice you can't rename files, copy or move files or delete files as you can so conveniently in MS Windows. There is no button to click on to go to a network and when you click on the drop-down box in LibreOffice file browse, there is no obvious tree allowing you to easily browse your network. But, and here's the really good news, there is a Gnome compatibility layer package that you can install (if you knew about it) that will solve some of these problems. You go to the Synaptic Package manager and in the search box, type Gnome LibreOffice. For Ubuntu 12.10, you really need "office productivity suite -- GTK+ 3.0 integration" but the earlier version I found seems to work also. That's what you need if you want to browse all files at your disposal when working within LibreOffice. So install the package and things seem to work really, really well. this bug i'ts still present on a new clean kubuntu 12.04 installation. Defaults libreoffice version 3.5.3.2 Build ID: 350m1(Build:2). Or updating libreoffice from launchpad, version LibreOffice 3.5.5.2 Build ID: 350m1(Build:2) and should not be marked as duplicated of a fixed bug. +1 on the invalid duplicate status. This bug is about using libreoffice with KDE. The fix suggested in comment 15 does not work on Kubuntu 13.10 or 13.04.